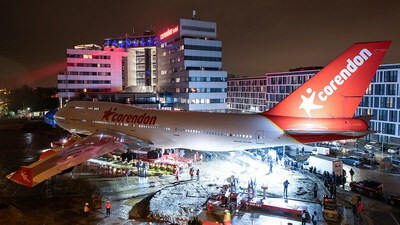 After a five-day mega transport from Amsterdam Airport Schiphol to Badhoevedorp, the Corendon Boeing 747 has arrived in the garden of the Corendon Village Hotel this morning. There the plane will be converted into a 5D-experience about the 747 and the history of aviation later this year. De Boeing began its last journey from Schiphol Airport on Tuesday night. The dismantled aircraft was placed on a trailer of specialised transport company Mammoet to cover the 12.5 kilometers to the hotel. During that, the aircraft had to cross 17 ditches, highway A9 and one provincial road. The A9 was successfully crossed in the night from Friday to Saturday. In the night from Saturday to Sunday, the transport crossed the Schipholweg after which it was parked backwards into the hotel garden, requiring 57 movements. The spectacular transport attracted worldwide attention and was covered by national en international media. The Boeing 747 is the former KLM aircraft 'City of Bangkok' that will be given a new final destination in the hotel garden after 30 years of reliable service. The plane is 64 meters wide, 71 meters long and weighs 160 tons. To keep it safe and steady, the aircraft has been lifted on 1.5 meters high steel bases, totalling 15 tons of steel. These are built on heavy concrete slabs, strong enough to carry the enormous weight. De Boeing will be converted into a 5D experience later this year. Visitors will be able to walk on, over or under the plane and visit places that are normally not accessible to the public. They can visit the cargo area where the luggage is loaded, learn about the fuelling of the plane, take a look in the kitchen of the business class and the cockpit on the upper deck. They can even do a wing walk over the thirty-meter-long wings. Visitors also make a journey through the history of aviation. That begins with the ancient human desire to fly and leads them from the first serious flight attempts around 1900 to the development of the Boeing 747. The highlight of the trip is the 5D experience, in which they can experience flying in all its facets. The garden where the Boeing is placed is partly an ecozone, open to hotel guests, and can be used as a festival site. Corendon founder Atilay Uslu had booked a room in the hotel. Exactly on the spot where - if everything went well - the nose of the Boeing would be placed in front of the window. "When I opened the curtains this morning, I saw her in full glory. I realized that after months of preparation we really succeeded in getting the plane to its final place with a lot of fitting and measuring. That kind of takes your breath away," he says. Corendon has expressed its thanks for the cooperation of the municipality of Haarlemmermeer, government agencies, various companies and its own employees, without whom the stunt could never have been successful. The transport of the aircraft this weekend coincided with the celebration of the first test flight of the Boeing 747 on February 9th, 1969, exactly fifty years ago. The 747 is an iconic plane and was the largest aircraft in the world until 2007. It could transport 2.5 times more passengers than other conventional types. It was also the first wide body aircraft, with two aisles. Characteristic is also the upper deck, where the cockpit is located. KLM introduced the first Boeing 747 in its fleet in 1971. The 'City of Bangkok', which was added to the fleet in 1989, was then baptized by nine Thai monks. After almost thirty years of loyal service, the repainted aircraft now decorates the Corendon hotel garden. The last five-day trip of the Boeing was an impressive operation. The plane first had to be transported 8 kilometers over the Schiphol airport area and then another 4.5 kilometers through the fields. Heavy transport specialist Mammoet transported the 160-tons aircraft on a trailer that weighed even more: over 200 tons. The trailer divided the weight of the Boeing over 192 wheels. To make sure the trailer would not sink into the marshy land, a special road was constructed of approximately 2.100 metal road plates weighing 1.500 kilos each. Special bridges were built over the 17 ditches. The trailer was traveling at a speed of 5 kilometers per hour and was controlled remotely by people from Mammoet, who walked beside it. It was powered by two so-called power packs, each with a capacity of 390kW, generating more than 1000 hp. A total of 18 turns had to be taken during transport, of which the first 7 were on the airport. Corendon is a leading tour operator, airline company and hotel chain on the Dutch and Belgian travel market. In 2018 Corendon gladly took care of the holiday for over 750.000 holidaymakers to dozens of sunny destinations in and outside Europe. Corendon's aviation business includes Corendon Dutch Airlines, Corendon Airlines Europe and Corendon International Airlines with a total fleet of eighteen aircraft. Corendon Hotels & Resorts offers ten hotels and resorts in the Netherlands and Turkey and on Ibiza and Curaçao. Corendon has a strong market position due to its sharp prices, its no-nonsense approach and its extensive experience in the travel industry. More information can be found at: https://www.corendon.com/en-EN/a/about_us. Very soon Ricky will have a little brother named Martin. They will together share a wonderful journey through life. A vacation package? Thousands of customers enjoy a hotel, a holiday apartment or a house. You expect luxury? Love, adventure, travel, enjoy summer nights on the beach. From here you can access your accounts of Toumsy & Tourismembassy platforms. You can only use login with Facebook and Twitter buttons if you have linked your account previously. Promote & increase your visibility now !